Home / With snow plough easier through the winter! Labinprogres – TPS had in 2013 launched, in its own production, snow plough in two versions: with communal linkage and front tractor hydraulics, in accordance with norms HRNEN15432-1: 2011. 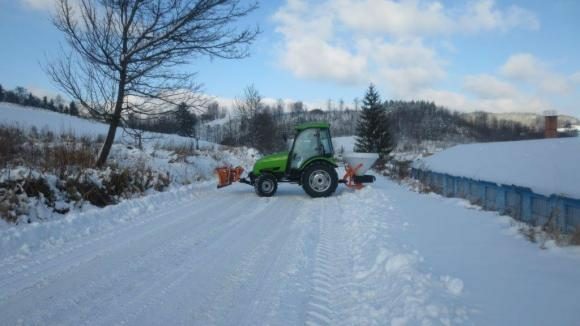 Labinprogres snow plough is robust but agile, flexible and compact board, which is by its features, an excellent choice for holding municipal and local roads during winter conditions. Also, snow plough is very suitable for maintaining family farms. Narrow urban and suburban streets, city sidewalks, different approaches, parking lots, long distance roads do not make an effort for this plough that is, by its characteristics, designed for easy maneuvering. Control over snow plough is enabled through the hydraulic system, which is standardly delivered with a tractor Tuber 40 and Tuber. Optionally, it can be provided with the control board with hydraulic system equipped with “joystick“. Snow plough width of 2 m and a height of 0.70 m is available with communal linkage and front tractor hydraulics, precisely front linkage in three points, category 1. By the front linkage in three points, manipulation of plough is performed in horizontal and vertical direction through double-acting cylinders. In the system of communal linkage, manipulation in the vertical direction is carried out with single-cylinder, while in the horizontal direction by double-acting cylinder. Snow plough is ensured from collision by the spring mechanism that moves entire board. Moving of the snow plough can be made in left or right side (± 30 °) by hydraulic cylinder. Lateral adjustment of the plough to the field allows system of springs, while the vertical adjustment to the ground is enabled by floating hydraulics in combination with wheels. Snow plough knife is made of high wear-resistant steel (Hardex 450) which is optionally replaceable. For safe circulation at night and in low visibility, snowboard is equipped with lighting. 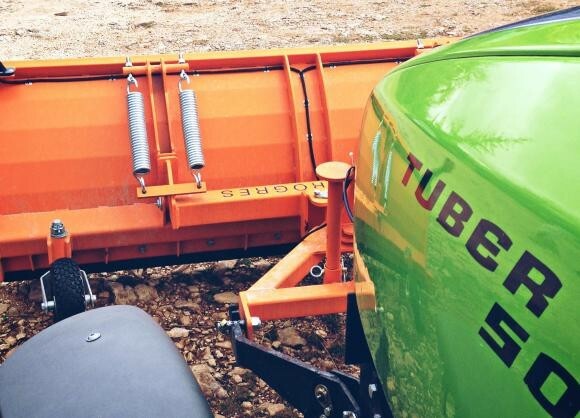 Snow plough in the production of Labinprogres-TPS for tractor Tuber Tuber 40 and Tuber 50, can be seen by all interested buyers at authorized dealers in Croatia and in the region.